Do you have any great ideas for Betway Adverts? 2018 could be a huge year for the betting company and they could hopefully release quite a few more funny adverts for us to look at. Please feel free to leave a comment if you have any theories or ideas for the 2018 adverts that they could release and we will be sure to feature our favourite in the article! 2017 was a great year for Betway who mainly focused on their advertisement series ‘For the Love of the Game’. It involves several different adverts set in different dangerous scenarios across the globe. One character is very calm about the very bad situation they are in and is betting whilst the other is very scared and panicking. It usually relates to what happens on the Betway application on the character’s phone. In this advert from Betway, a man in a nice white suit is seen strapped to a table with a saw on the verge of cutting him in half! A man in a red suit is holding him captive who is playing on Betway’s bingo app and implies that if a team scores he will be killed. In the end, the man in red cashes out and the saw between his legs stops moving towards him just in time because of this. It is a great advert that involves tension, humour and successfully does the job of promoting all of their offers and features of their phone application. The cash out option is a very big part of bingo on apps now and Betway makes sure they show potential customers that they can use this feature with them. In this Betway advert, the scenario is of two blokes stranded at sea with only a rubber dinghy to keep them afloat. With one realising the danger and panicking, the other takes it easy and pulls out his Betway app. Sharks then start to appear and whilst the better is talking about the Manchester derby, the panicking man starts fearing the worst and therefore panics even more! Eventually, City score and at the same time the sharks attack the dinghy, causing the man to scream and causing humour as the other man thinks he’s a City fan! This is a really funny part of Betway’s ‘For the Love of the Game’ series as it follows the same structure of the other parts but is in a completely different area. Betway doesn’t hold back on these adverts and it may appear as quite a scary scene for children! We think that 2016 was definitely Betway’s most successful year. They managed to successfully target the Euro 2016 campaign by creating a number of adverts for their popular series ‘For the Love of the Game’ in which we see a number of different adverts that allow the gambling company to promote their services before, during and after the world football tournament. This time, the lads are stuck in a very snowy landscape in a lodge that seems to be almost completely under the snow. A polar bear then busts through the window causing havoc and grabbing one of the men. The man who is on his phone when continues to talk about betting as if nothing has happened. 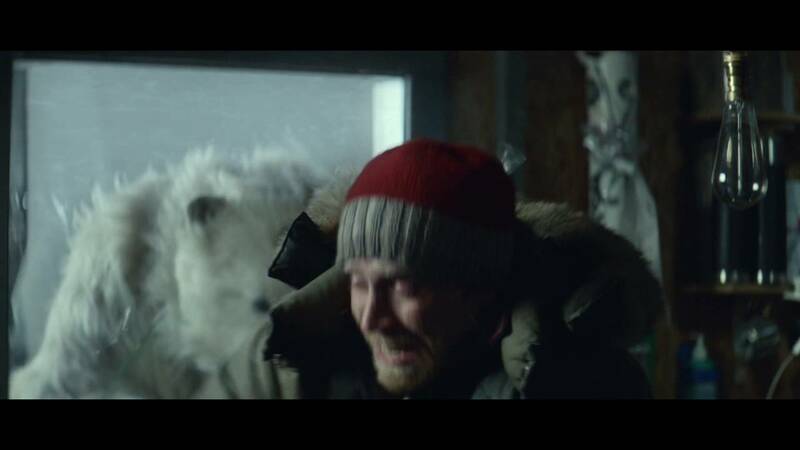 He places bets whilst the polar bear is grabbing his friend behind him and the ad closes off with the massive white animal towering over the man. Great use of editing from Betway. This follows the standard structure of Betway’s ‘For the Love of the Game’ advert series and continues to do a good, successful job in promoting Betway’s new application that anyone can use on their phone during a match or sports event. In the final advert of this series, the two men are this time in a spaceship in space. The ship begins to completely fall apart and inside the ship, we see two new characters. In standard ‘For the Love of the Game’ fashion, one man is seen in a panic, whereas the other is laughing and happy even though his whole ship is being destroyed! He talks about betting, places a bet and watches the live football through his screen. The other man is then forced to push the evacuate button and says ‘here we go’ to which the relaxed man replies with a football chant. Loving the @betway astronaut advert ?? This is arguably one of the best settings of the advertisement series as there will have been a lot of money put into editing and the scenario equipment that is used. For this reason, we would love to know your opinions! What was your favourite setting from the ‘For the Love of the Game’ campaign? Betway provide many different camera shots for their horse racing advert. This advert was a different style of an advert for 2016. It has different camera angles and shots to emphasize different aspects and portray different emotions. Since the advert is not made to be funny like most betting adverts nowadays, it had to be much more different to the other adverts. Its main purpose is to be motivational/inspirational over being funny which is obvious due to the voice actor’s tone and all of the different slow motion shots. We see camera shots such as a POV of a horse rider and slow-motion shots of the horse’s legs. It is a great advert that enables Betway to promote their amazing betting benefits and helps to tempt potential customers into choosing them over their betting competitors. 2015 was a much quieter year for Betway as they only released a few adverts. This was understandable after a heavy campaign in 2014 in for events such as the World Cup. Although this advert was broadcasted in Germany, the message is very clear and that is why it has made the list of our best Betway Adverts. In reality, it is a very cool advert that sports fans all over the world love. It involves a number of different sports being played in a house. There is a game of hockey in the fridge, tennis on the table and football where the TV is! It is a really funny and unique advert which is why it did so well. The main reason why this made our list was that it really relates to the title ‘The Home of Sports Betting’ due to the advert being set in a home and because it is all about sports. 2014 was the first hugely successful year for Betway as they created their first advertisement series which featured 4 different characters named Lucy, Dan, Frank and Teri. In Lucy’s advert, we see her running her hairdressing store and talking about the friendliness of her customers. She says she loves her job and talking to her customers who happen to be big bingo fanatics. She continues to talk about bingo, explaining that she isn’t really a bingo player, but rather a Betway Bingo player. Betway is able to promote their services as Lucy explains that Betway has great games, great deals and great bonuses. We get to see her using a tablet and a close-up of Betway Bingo on this tablet. There is even a little bit of humour involved as she says ‘I’m a lucky lady… sometimes’ referring to the bingo. Dan is completely different to Lucy and loves to play Bingo on the go. In the advert we see him playing it in a number of places on his phone and tablet. He plays bingo in the desert, on a busy coach, at a busy bar, at home and on a road trip in a van. The message in the advert is ‘you never know where the journey will take you after all anything can happen’ and that is a perfect reference for an advert that involves a man who seems to travel everywhere! Frank is a limo driver or a chauffeur. He spends his time transporting VIPs and highly popular celebrities from destination ‘A to B’. He also promotes the message ‘Anything Can Happen’ which is a really good message to give to potential bingo players to try and attract them into using Betway Bingo as their main bingo platform. Live odds are also mentioned due to the character being a taxi driver and we see him after his shift at work enjoying a world cup football match with thousands of other fans of the countries that are playing. Live odds are also mentioned due to the character being a taxi driver and we see him after his shift at work enjoying a world cup football match with thousands of other fans of the countries that are playing. The last advert of the series is of Teri who appears as the boss of a bingo company in the USA. The employees bring up the new competitor which is Betway Vegas and they try the service that they offer. It leads to them really enjoying Betway Vegas and creates humour in the advert. The ‘new game in town’ eventually leads to the boss trying it out and the advert ends with her really enjoying playing Betway Vegas. This is really funny as she is very strict but is really enjoying the game when she really shouldn’t be! We love every one of these adverts and can’t make our mind up on which is our favourite! So which was your favourite? Feel free to comment below letting us know who you think was the best and which one you didn’t like.